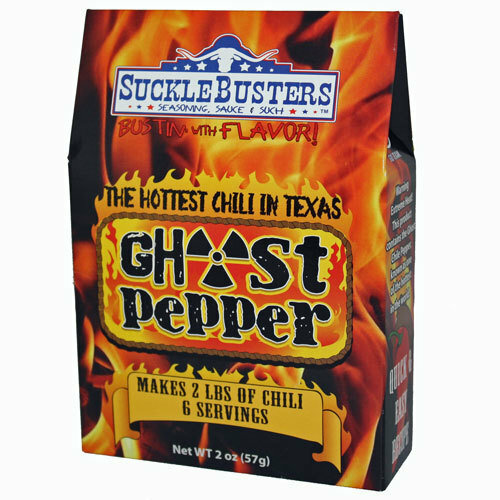 SuckleBusters Ghost Pepper Chili Kit is the hottest chili in Texas! Made with Bhut Jolikia, ghost peppers. Beware this chili is HOT! When we say beware, we mean BEWARE! This kit makes the hottest chili in Texas! We start out with our award winning blend of chilies from New Mexico to create and traditional base then add Bhut Jolika Ghost Chilies to take the heat level where only the hottest fiery food lovers can tolerate. Don't worry, we tone down the ghost chiles with habanero chiles and chilpotles to round out the flavor profile. Can you take the heat? In 2007, Guinness World Records certified that the ghost pepper was the world's hottest chili pepper, 400 times hotter than Tabasco sauce. The ghost chili is rated at more than 1 million Scoville heat units (SHUs).